LacPatrick Dairies may be less than three years old but the dairy co-operative is steeped in over 100 years of tradition. Dairy co-ops can be, by their nature, reluctant to the prospect of merging with another co-op. However, LacPatrick is an example of one of the largest mergers in the dairy sector on the island of Ireland. LacPatrick was formed in 2015 following the merger of Town of Monaghan (est 1901) and Ballyrashane (est 1896) co-ops. The coming together of the two co-ops has resulted in an entity with some 1,050 farmer suppliers from both sides of the border producing 650 million litres of high-quality milk. It has processing facilities in Monaghan town, Ballyrashane in County Antrim and Artigarvan in County Tyrone. It also has distribution centres in Enniskillen, County Fermanagh and in south Dublin. It is truly a cross border entity. “We have a determination to innovate and to be constantly improving,” according to Chief Financial Officer and deputy Chief Executive of LacPatrick Michael Collins. LacPatrick produces liquid milk, butters, skimmed milk powder (SMP), whole milk powder (WMP), yogurt, cheese and cream. LacPatrick products are exported to every continent on the globe. As well as owning a successful domestic milk brand and butter brand called Champion, LacPatrick, under its LP brand, is market leader for powders in west Africa. LacPatrick has long standing and successful relationships with major retailers across the island of Ireland including Aldi, Lidl, Marks and Spencer and Dunnes Stores. It also supplies produce which is made into high grade infant nutrition products and exported to China and the Middle East. 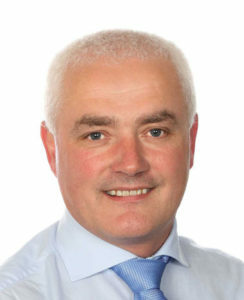 “We have a broad range of high-quality products and customers who know the quality they get from LacPatrick,” says Collins, who previously served as CFO and Deputy CEO of Cityjet. The centrepiece of LacPatrick’s innovation is a new €42 million (£30 million) investment at its facility in Artigarvan, County Tyrone. The facility was finished on time and within budget in 2017. The 7t/hour dryer is the first investment of its kind in the dairy industry in Northern Ireland. It uses the most modern technologies available to produce high quality products including a new instantised powder. The Artigavan investment was signed off by the board of LacPatrick prior to the UK electorate’s decision to leave the EU. Despite the fears around Brexit, Collins believes that LacPatrick has taken away much of the threat of Brexit thanks to the Artigarvan investment. “Somewhat fortuitously, we decided to the press ahead with the Artigarvan facility. There were only murmurings of Brexit at the time. The discussion had started around Brexit in the UK but neither LacPatrick, nor the vast majority of businesses believed it would come to fruition. Brexit is now a reality and we must work within those parameters to deliver for the benefit of our suppliers. “The biggest threat to our business arising from Brexit, is a fundamental and operational one; can we collect and process all the milk that our suppliers on both sides of the border produce should there be a hard border and a return to border checks? This is a challenge facing all dairy processors operating both sides of the border. Sustainability is a key aspect of LacPatrick at a farmgate and a corporate level, according to Collins. 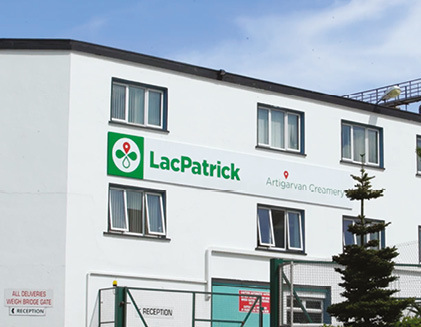 The Artigarvan development has ensured that LacPatrick is on course to be the most energy efficient dairy processors in Europe. As part of this sustainability drive, LacPatrick and the Artigarvan facility became the anchor client of the Gas to the West project with Electric Ireland. As a result of LacPatrick being the first company to sign up the Gas to the West initiative, the €282 million (£250 million) development will also see some 40,000 homes and businesses from Magherafelt, Omagh and Strabane as well as Cookstown, Derrylin, Enniskillen and Dungannon receive clean natural gas. “The Gas to the West project made a lot of sense for us in many different ways,” Collins says. 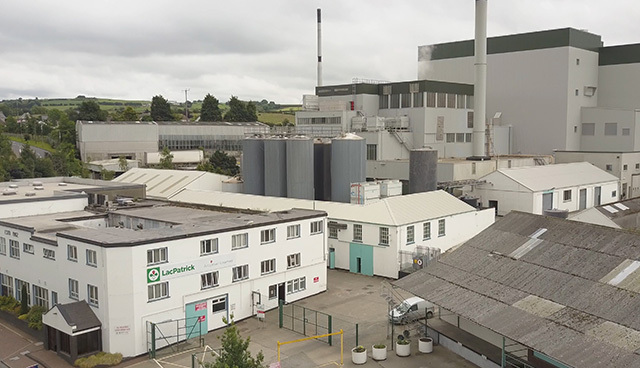 “It allows LacPatrick to continue on our drive to be the most sustainable co-op in Europe as it makes us a more energy efficient processor of milk. From being an innovator and a leader in business on the island of Ireland, the Gas to the West project shows that LacPatrick has a deep commitment to businesses and the communities in the area. From an infrastructure point of view, 2017 was a milestone year for LacPatrick. However, it was not just through a state-of-the-art dryer where the co-op was innovating. Last year also saw new, wide-ranging corporate governance structure put in place. Following the merger of Town of Monaghan and Ballyrashane co-ops, the two boards merged as one resulting in a board membership of 25. This needed to be reduced, Collins says: “We had to do a lot of work in terms of corporate governance following the merger. Having a successful co-op isn’t just about brick and mortar… we had to back that up in the boardroom too. “We sat down and strategised about what needed to be done. The board, along with the senior leadership team, led by chief executive Gabriel D’Arcy, devised how best we would implement those changes. The corporate governance changes were voted on and accepted by the suppliers. This resulted in four voting regions being created. From these regions a 60-person council is formed and from the council a 15-member board is elected. “I believe that we have the most robust corporate governance structures of any co-op on the island of Ireland as result of the steps we have taken. We also have the most democratically-elected board in the country. It’s innovate at all levels or get left behind,” Collins concludes. With the threat of Brexit looming on the horizon, LacPatrick Dairies is making all the right strides to protect its suppliers and business. LacPatrick Dairies’ tagline is ‘Dairy by Ireland since 1896’ but is certainly moving into the future.